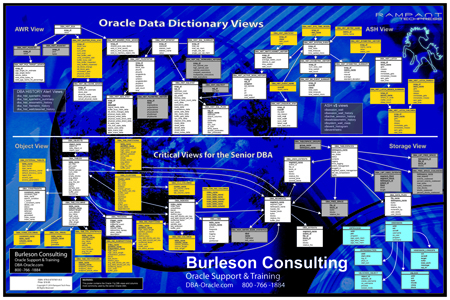 Burleson Consulting and Rampant TechPress are offering an Oracle database data dictionary poster. This annotated Oracle data dictionary poster only displays the most important DBA dictionary views, the important data columns and the relationships between the DBA views. It's a great cheat-sheet for writing customized Oracle dictionary scripts. The poster also include Oracle 12c details. Designed by Oracle expert Donald K. Burleson, this poster focuses on the most important DBA views to the underlying tables in the Oracle data dictionary. This poster is indispensable for every senior Oracle professional who requires an intelligent quick-reference Oracle poster for the data dictionary. Because of the huge popularity of this Oracle reference poster, Burleson Consulting is now offering the poster to senior Oracle DBAs. Get your Oracle poster Now! You pay $19.95 plus actual shipping costs - all posters are shipped in tubes, never folded. This comprehensive data dictionary view reference contains the most important columns from the most important Oracle DBA views. It also contains only the most important data columns with each DBA view so you can quickly focus on the most important column values for your Oracle data dictionary query. Unlike other posters that list every dictionary entity, this poster has a focus on only the most important dictionary views.